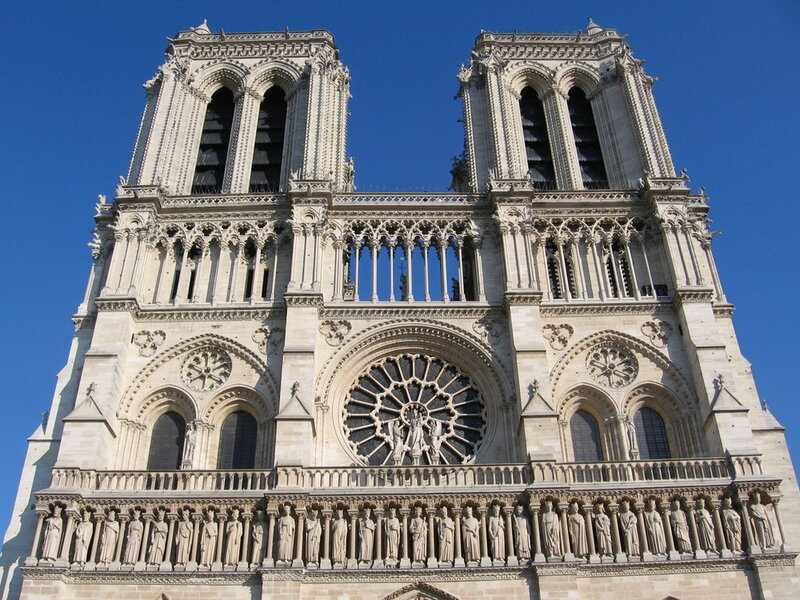 My photo of the west façade of Notre-Dame de Paris on Easter 2007. If we’re being honest with ourselves, one Gothic cathedral looks much like another. Which is why, as over the last twelve-plus hours I have tried to conjure up how it felt to visit Notre-Dame de Paris, I cannot bring up anything specific. The general feeling of medieval Gothic—high smooth stone walls, fluted ribs, stained glass that supposedly tells Bible stories for the edification of illiterate medieval peasants but is so high and distant that you wonder how those peasants were supposed to see the stories’ details—yes. The specific quiddity of Notre-Dame… not really, or not well enough. But I remember that, even though at 19 I already considered myself an ex-Catholic, I went to Easter afternoon service at Notre-Dame when I was studying abroad in Paris. Because it felt right to do so; the only possible thing to do on Easter in Paris. I saw the sunlight streaming through the great west door as we churchgoers streamed out to the sounds of organ music after the service celebrating Jesus’ resurrection, and felt… something. I took some photos that day, which are mostly very bad and very blurry (oh, 2007 digital cameras) but which I am still grateful to have, as we cling to any scraps in time of destruction. And at least a few of the photos, the ones from outside in the sunlight, capture this soaring, imposing, iconic building as well as any image could. But these, I now realize, are the thoughts of a prematurely jaded cynic. So, too, is the urge to say “well, according to the encyclopedias, there are taller French Gothic cathedrals (Amiens), or ones that even more perfectly exemplify Gothic style (Chartres), or ones that are more historically significant (Reims).” But size, or historic importance, or adherence to architectural rules, are laughably shortsighted ways of measuring the importance of a cathedral. Because the fact is, not everyone makes those side trips to Amiens or Chartres or Reims, but everyone passes through Paris—and when you do, you are almost guaranteed to end up in front of Notre-Dame, even if you don’t step inside it, even if you are prematurely jaded. After all, Notre-Dame is at the very heart of the city. Paris would not exist where it does if there were not two little islands there in the Seine that make it a natural place to build fords and bridges and settlements, and Notre-Dame stands at the midpoint of the islands, at the heart of the most-touristed, most-beloved city in the world. The real way to measure a cathedral has nothing to do with numbers—it is about the community it creates and the different kinds of communion it allows for. And for many people, even for those who cannot believe in the bread-and-wine communion of the Catholic faith, buildings like Notre-Dame nonetheless allow for communion with Love or Time or History or Truth or Goodness or Beauty—all the great abstract forces that rule our lives. The destruction of such a building severs that connection and leaves us feeling a little more alone in the world. Especially for those of us who have no discrete memories and no coherent philosophy—just blurry photographs and inchoate feelings.